Somewhat Quirky: Friends Help Friends Find Stuff! Friends Help Friends Find Stuff! The other night I got a text alert for this chair. A friend walks the neighborhood streets on trash pickup eve and sends me text alerts for stuff she thinks I might like. I look at the picture and evaluate whether I think it is worth putting on clothes and driving over to pick it up. Sometimes the pictures aren't very good so it's always a gamble. About half the time I don't feel like getting out and about half the time I go out I don't bother to pick up whatever it is. I thought this was worth a do-over. So it sits with my stash. I'm glad to have it. Free! 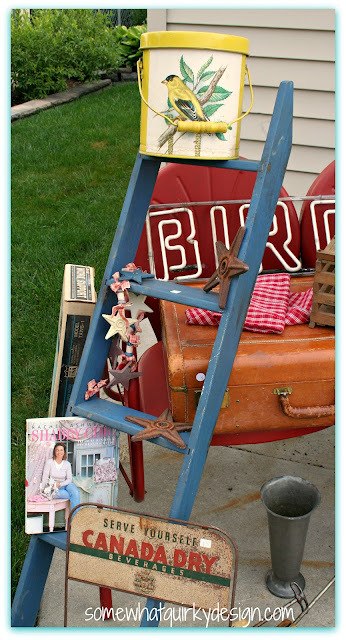 Then it was Friday - garage sale day. I did some painting for a neighbor friend a few weeks ago and she wanted to take me out to a few sales - her treat! Ummm yummy! I had seen this little plant stand at a sale the night before and wanted to go back to see if it was still there. It was, so I picked it up along with a lot of the items you see below. We were looking for some things to use for the front porch decorations for the 4th of July. I love this plant stand - I think it would be way cool as a bedside table. I don't think I have a spot for it in any of my bedrooms though so I'll have to think of another use for it. It is probably a little too aged and delicate to leave outdoors year round. That tote bag got turned into a no-sew decorative pillow for the 4th of July. I planted up one of the smaller buckets with red petunias. 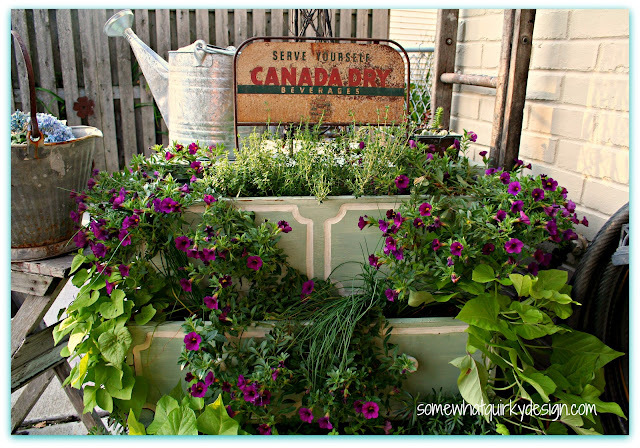 I put the little Canada Dry sign in my planter dresser. It has filled in nicely don't you think? Everyone should have one of these. You won't regret it! See how I did it here. 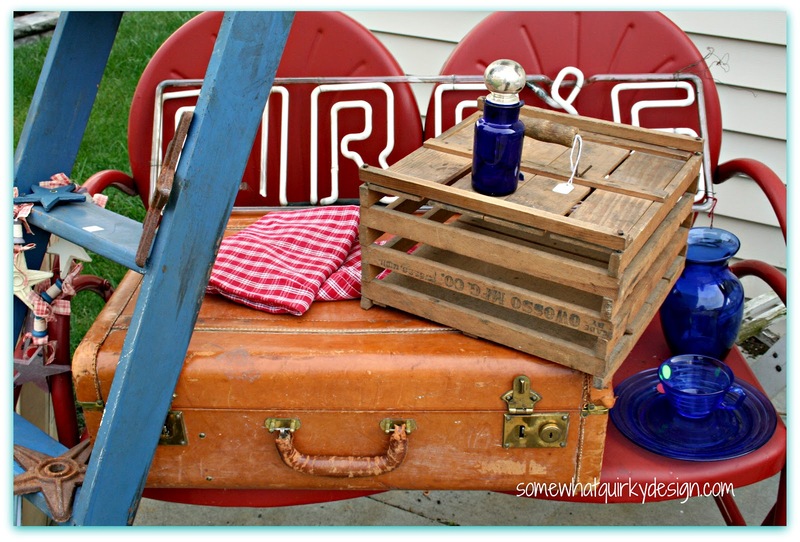 That wooden crate is an egg box! 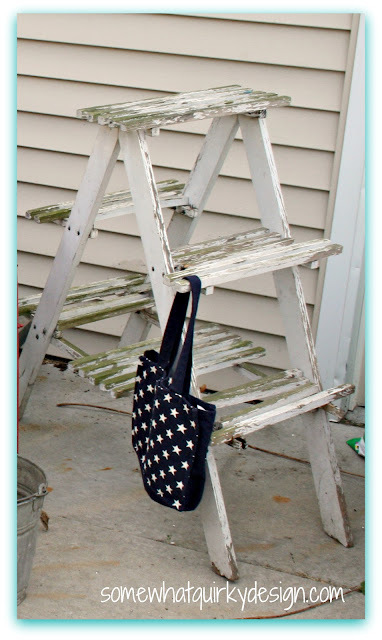 I used it on the front porch along with the tea towels, blue dishes and the metal and wooden stars. I was excited to find this little neon sign. Of course it doesn't work. I kind of blocked it in the picture - it says BIRD'S It's pretty delicate so I think I will mount it on a board to keep it safe. 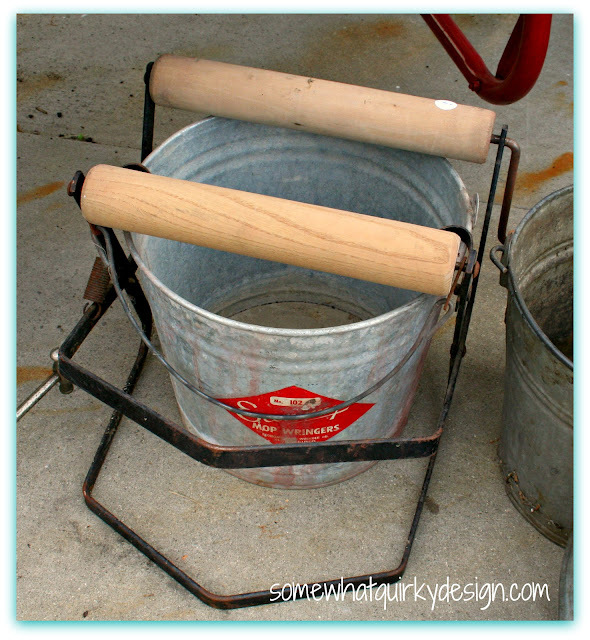 I found this mop bucket at an estate sale - in the basement of course. The basement is my favorite room at estate sales. I don't think it has ever been used. The wooden ringer thingies are pretty pristine. The jury is out as to whether I would have bought this without inspiration from one of my favorite blogger friends. I like the bent up pewter vase. It kind of reminds me of a trophy. I'm not using the little ladder for anything yet. I don't really like the blue so I guess I will paint it at least. That box in the background is a work support - it is a tripod with an adjustable T-arm that works as a 3rd hand with long things like boards when you are sawing. Ok so your not getting the vision....click here to see one. I thought I got a good deal @ $6 but new ones cost less than $20 so maybe not. But I have one now. I would never have thought to buy one - but I will be infinitely safer working with wood pieces and saws. Seems like all this stuff combined was around $60. I feel pretty happy with all of it. Thanks friend Joan for a great day of shopping! Holy smokes Karen!! Those are some great finds! 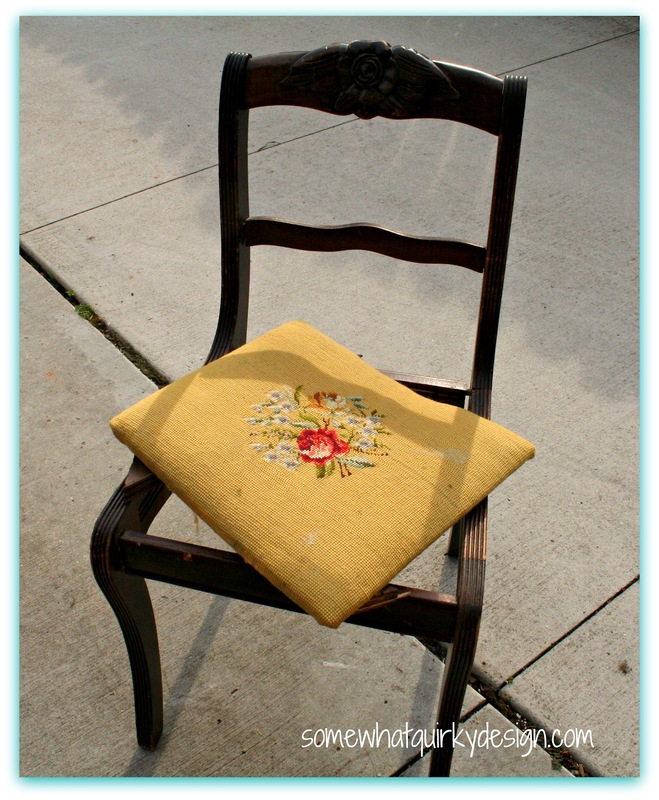 I have a chair just like that first one in my garage awaiting the treatment! The seat cover is darling too....you could make it into a pillow! Good friend!! I am in love with the Canada Dry sign....adorable! Lots and lots of great items. Love the ladders, the buckets and the signage! you do have a good friend to pick the trash for you! That is some sweeet junk!! You have a great eye. Forgot to mention I'm a new follower. PS...Signed on as your newest follower! I AM DROOLING ver these jewels! lucky girl you are! very nice picks, you rock!And thanks for visiting my blog and leaving a comment!! I need a friend like that. What a super friend you have. I love that red glider. I'm sure you will think of something awsome for the ladder. 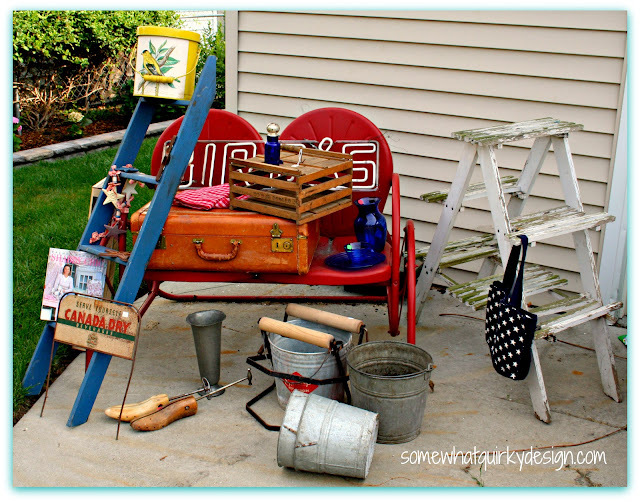 Great stuff and I especially like the Canada Dry sign in your beautiful garden dresser planter. Boy, did that fill in beautifully. This is my first visit to your blog. I found you when I linked (for the first time) to Miss Flibberitgibbet. It cracked me up because I do the same thing with friends. You really have a great pile of stuff! You may want to visit the great barn sale I attended this weekend.It was barn sale heaven!